Preheat oven 160C.. grease and line ur 7 or 8" baking pan.. wrap bottom of ur baking pan with aluminium. Heat butter and milk till warmish.. do not let it boil ok.. switch off heat and add in sifted flour and corn flour.. mix using wooden spatula. Transfer to a bigger bowl and add in ur eggs.. continue to mix till smooth. Pour batter into baking pan and bake it au bain marie method for abt 45 mins. Chill mixing bowl and beaters in the freezer for 10minutes. Put the cold water in a small saucepan. Sprinkle the gelatin over the surface of the water and let stand for 5 minutes. Place the saucepan over low heat and stir constantly with a wooden spoon just until the gelatin dissolves. Remove the saucepan from the heat and cool to room temperature. Remove mixing bowl and beaters from freezer. In the mixing bowl, combine the whipping cream, sugar, and vanilla and whip until slightly thickened. Then, while beating slowly, gradually pour the gelatin into the whipped cream mixture. Then whip the mixture at high speed until slightly stiff. In a medium saucepan combine the sugar and water. Bring the water to a boil, stirring, until sugar has dissolved. Remove from the heat and allow to cool. Reserve a handful of strawberries (the prettiest ones!) for decorating the top of the cake. Dice the remaining strawberries into small cubes. Macerate them in a little sugar and set aside. Slice the sponge cake horizontally into three layers. Place one sponge layer cut-side up on a cake board and lightly brush the surface with the limoncello simple syrup. 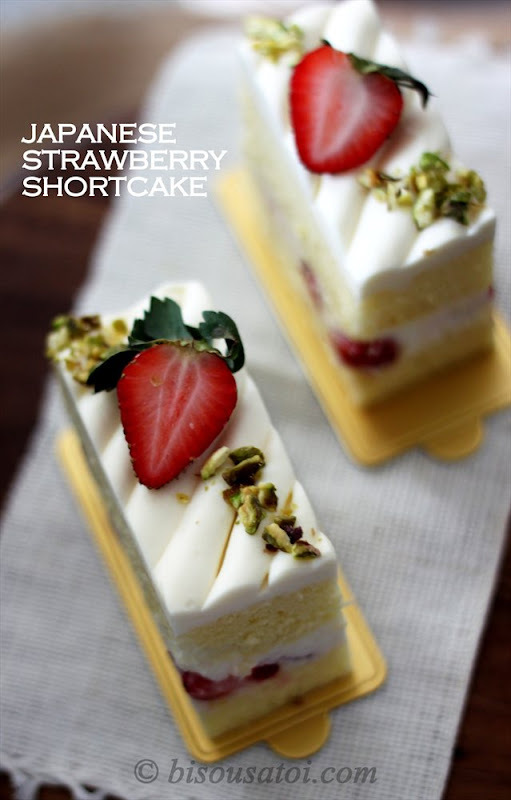 Spread a thin layer of whipped cream over the cake layer and arrange the strawberry cubes over the surface. Spread a thin layer of whipped cream over the strawberries. Brush the cut-side of the second layer with the simple syrup and place it over the first layer. Frost the sides and top of the cake with the remaining whipped cream. Repeat with remaining third layer of cake. 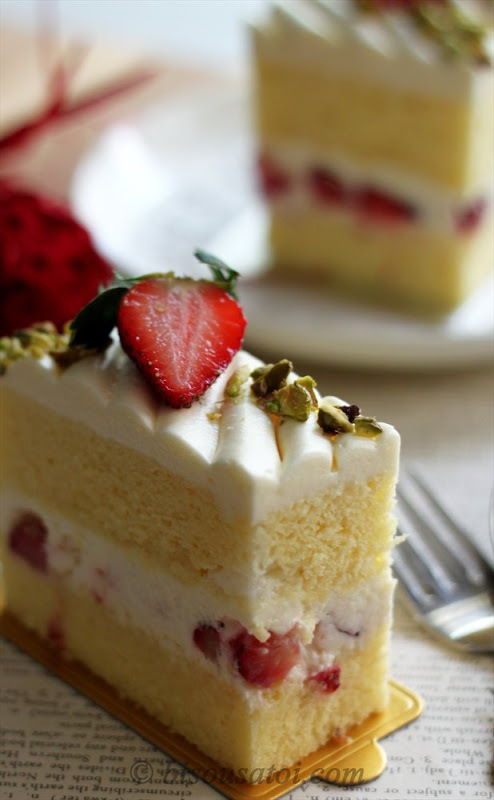 Spread a thin layer of cream over top of the cake and return to fridge to chill for thirty minutes. Using the leftover cream, pipe the cream as decoration. Chill in fridge for cream to set for an hour or so. Garnish with the reserved strawberries (sliced in halves). The cotton cake tasted superb.. the whipping cream was to die for.. u will be seeing me using the same recipe over and over again with different kind of fruits lol..
My fussy hb ate two slices of my strawberry shortcake - case closed! Sedap nye...., nak tanya boleh? Utk whipped cream guna dairy or non dairy?. Salam Kak Rima..mmg cantik..hasil tangan kak Rima nie..I Like.. If only u ddk se lorong or se taman dgn I, it will certainly make my life sweeter, yummier n my body heavier n broader. Not complaining though... just loving it. What a coincident. 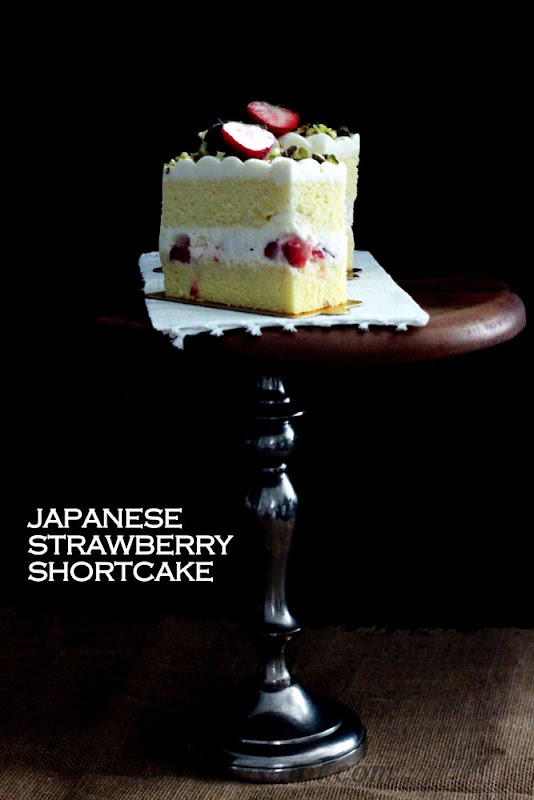 I have been looking at Jap strawberry shortcake and you are posting one too. I have been reading your blog for a few months now and is enjoying all the recipes posted. wow this is so tempting...harus di coba! 1st time comment ni..hehe..dah lame nk try buat this cake...perhaps i should try this recipe! But i always hav problems in slicing my cake horizontally..always senget benget..tangan tak berseni agaknye..care to share any tips?...thank u in advance..
i think u will like it too! kepakaran tu ade cuma tersembunyi.. cuba kasi dia exposure sikit sure kepakaran mu akan terselah hehe.. happy baking dear! hehe cannnn.. kalau boleh sekarang jugak ku kasi merasa ..
Yg benar tu semalam waktu he had it for the second round kita dah nak pi jb kejap tu yg dia stop tak?? hahaha macam ye ye ajer.. yg benar tu 2 slices boleh tahan jugak .... malam nanti sure dia mintak lagi..
no tips actually.. ur cake harus betul betul sejuk baru potong.. ade orang masuk fridge dulu but i no like.. so i bake early.. kasi betul betul sejuk then i use that "slicer cake" fm wilton to get a straight cut.. it has like a measurement on both side where u can push up and down to adjust the thickness u want.. berguna benda tu! Blowing all the good luck tu u hehe.. i am 100% sure ur cake will turn out well.. no worries! tak payah pun pakai mixer.. well except waktu nak kocok putih telur dgn gula..
first part tu.. cair kan mentega dgn susu, jgn sampai bubbles.. kalau nampak berwap and butter dah cair tutup kan api.. then tuang kan melted butter/susu kat dalam another bowl.. lepas tu telur yg dikocok lepas dgn garfu u add.. stir stir then add in tepung yg diayak dgn cornflour.. mix it and put it aside..
Lepas tu baru whisk egg white dgn salt.. masuk kan gula in 3 addition and pukul hingga soft peak.. masuk egg white kedalam butter mixture.. macam buat chiffon cake ok.. thats it..
no worries.. semoga cocok dgn selera cik cek! tergoda betul nampak kek tu..menyelerakan sungguh..satu potong tak cukup...ehehe..
Ampunnnnnnn cantiknya! Tak leh tengok lelama... nanti dengki.. hahahaha... dengki sebab tak dapat makan! masyaAllah! the cake is so gorgeous!! eh eh nice layout la dear! They are two diff things dear.. one taste macam buttercream.. one taste fresh cream.. kalau nak lagi segar sudah tentu si fresh cream but kan if u nak buat untuk bday i tak galak kan cos dia cannot stand in room temp dari pagi hingga ke malam hehe..
Insyallah u will.. keep on baking and keep on trying.. this is pretty simple to make and i am confident everyone can do it..
great combo babe! it looks intricate, but hey, what the heck la kan.
hv fun baking the double choc cookies ok dear! salam sis rima, this is my 1st time commenting after yrs of following yr famous blog hehe..i'm sold lepas tengok yr most cantek s'berry cake tu..can't resist to bake mine and its already in the oven now! but darn, i letak cold water for the bain-marie, harap2 jadilah nanti.. I've been your silent reader for some time now and in fact i've tried most of your cakes.they are all very yummy and the recipes are easy to follow.However i have yet to succeed in making your red velvet cream cheese icing lah selalu tak jadi so last2 i had to create my own cream cheese frosting. anyway i have a question.what kind of vanilla essence/extract do you use ya? sebab i always use vanilla flavor dari star brand je but I'm looking for vanilla essence yang alcohol free to use.vanilla flavor can be bitter kan if you use it for frostings or cream based. made this cake on sat. Memang sedap!!!!!! Mintak ampun!! 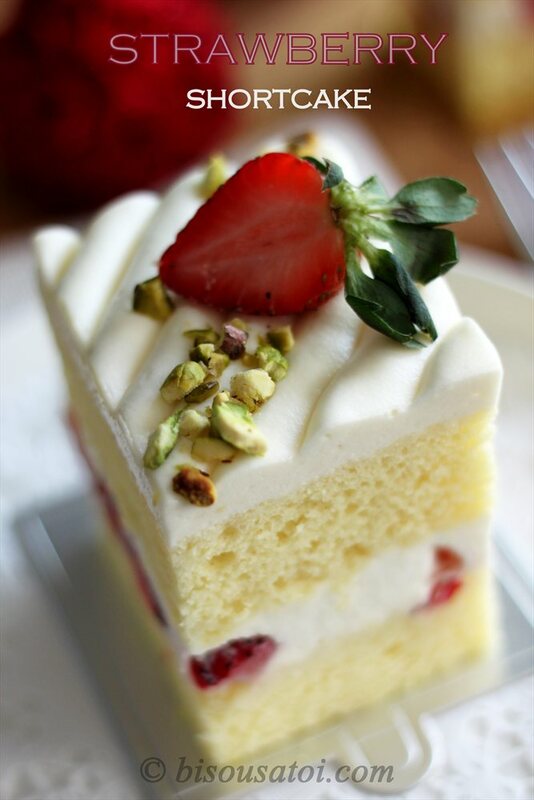 I cut a piece for my blog photo & after that i kept admiring it... sayang nak makan....boleh? Anyway, thnks for sharing! Hahaha! You are so funny!!! Tks! ur cake has to be cold when u slice it.. Thanks Rima! I will keep that in mind in the future. 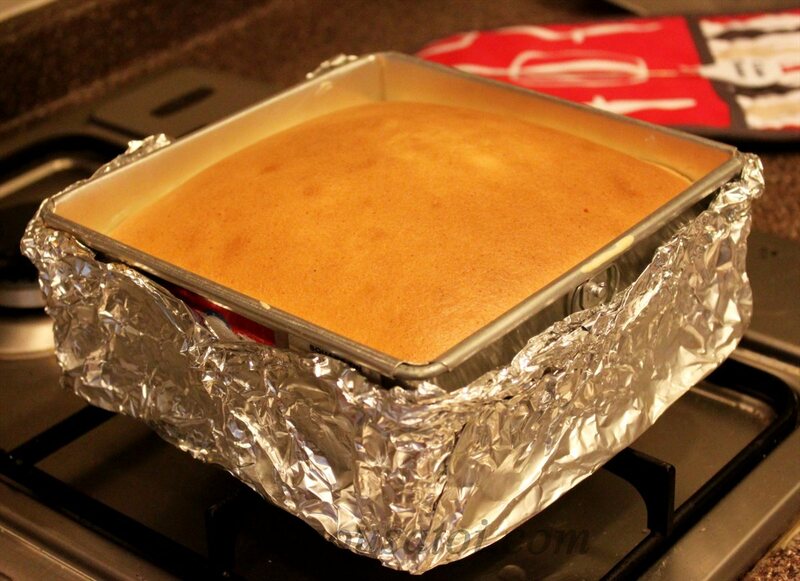 By the way, have you tried using baking powder / baking soda on your sponge cakes? would it help the cakes rise better and turn out more spongey? Yes i hv tried using them in my sponge cake recipe.. it helps of cos! 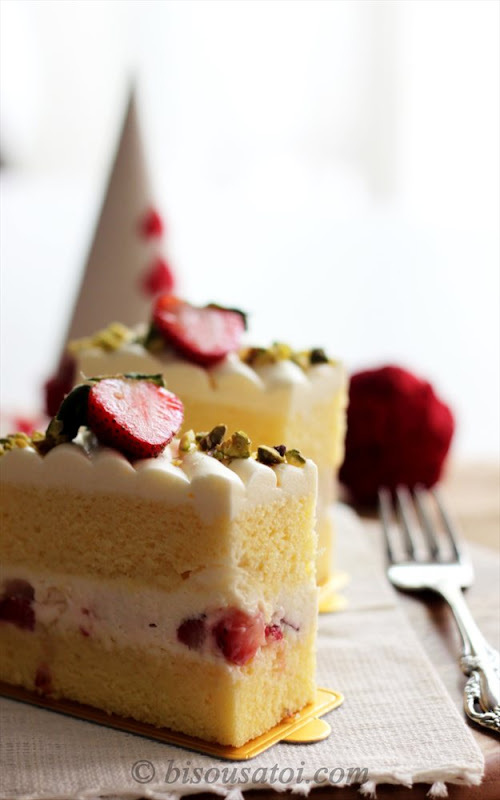 I tried baking this, but somehow the top half turned out fine, whereas the bottom half became semi solid like 'kuih' T_T. Can you tell me whats the problem here? Hmmm usually when that happens to my cake.. i suspect i must hv over fold my batter.. pls do it gently.. same way how u wud prepare chiffon cake.. I am always impressed with all your baking and love looking at those delicious photos of yours. I have question is the corn flour the same as corn startch? And how thick is your pan? yes its the same thingy.. as for the thickness of my pan.. err i guess its the same as those normal baking pan that u can buy in any bakery supply shop? Hi Rima. This is Charlotte from Johor. I've tried to bake it yesterday, the cotton cake rise well, the texture is good when it come out from oven. But slowly it become less spongy when it cold to room temperature. The cotton cake become even harder and dry after refrigerated. What is the problem? I will bake it again tomorrow, please help.